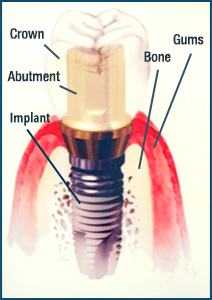 Dental implants are posts, made of titanium, that are surgically placed into the jawbone where teeth are missing. 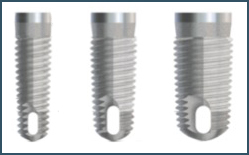 The titanium post function as a tooth root substitute. The bone bonds to the titanium surface of the implant, creating a strong foundation for the artificial tooth or teeth. There is a small abutment or post that is attached to the top of the implant which allows placement the crown or cap that looks like a real tooth. 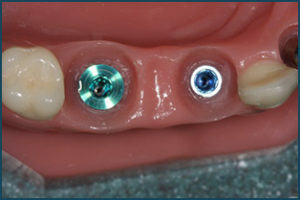 See figures A and B for a description of the implant and its components. 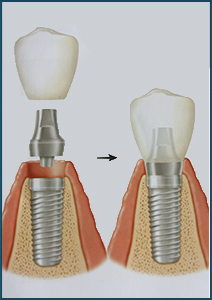 Dental implants come in different widths and lengths depending on the tooth it is replacing. Wide diameter implants are used for molar teeth while smaller diameter implants are used for front teeth. Molar (green) and Bicuspid (blue) Teeth.